There are lots of bookmarks managers out there which you can use to save your bookmarks. Also, all the mainstreams browsers have bookmark managing and syncing capabilities. But, in case you are too concern about your privacy and do not want to sync some or all your bookmarks with Google, Mozilla or any other account then, you can use other privacy-focused solutions to save bookmarks securely. This article covers a free decentralized bookmark manager to securely save your bookmarks. Clickbox is a decentralized bookmark manager that is built upon the Blockstack platform which is powered by Blockchain technology. You can add any number of bookmarks to this bookmark manager. It saves all the bookmarks to encrypted and decentralized storage with eliminates the privacy concerns. So, let’s check it out in details. 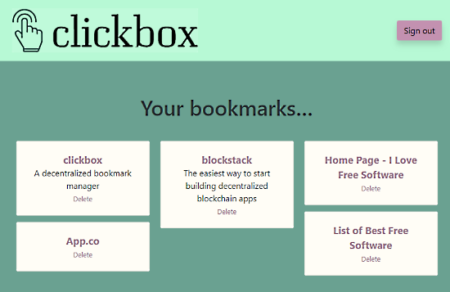 With Clickbox, you can save bookmarks securely to a blockchain based encrypted storage. As this bookmark manager is built upon the Blockstack platform, you need a Blockstack ID to use this service. If you don’t have a Blockstack ID, you can create one here. Once you have an ID, simply go to Clickbox webpage and sign in using that ID. On the main page, this bookmark manager lists all your bookmarks. By default, it has three bookmarks to its services which you can delete and add yours. Below those bookmarks, it gives you an option to add bookmarks. Here, you can paste the URL which you want to bookmark and add a title for that along with an optional description. In case of most URLs, this service automatically fetches the title but you can still modify that if you want. There is no option to import or add multiple bookmarks at once. So, you have to add all the bookmarks manually one by one. The bookmarks you add to this bookmark manager are saved in chronological order. Each bookmark has its title on top with description (if available) in the middle and a delete option at the bottom. The title is clickable which takes you to the URL of that bookmark. 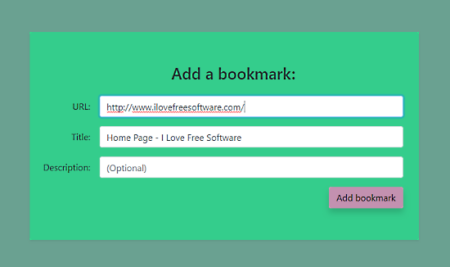 This bookmark manager doesn’t offer any other options to send, share, or download bookmarks. Because, in doing so, the data should be encrypted first which contradict the use of encryption at the first place. You can try this free decentralized bookmark manager here. Clickbox is a good service to encrypt bookmarks and saves them to secure storage. The lack of batch operations and import/export make it little time-consuming but it’s nice to have an option to encrypt bookmarks.